Earlier this year, physicists explained that according to "Quantum Entanglement" two particles which are light years away can still influence each other; for instance if one particle is poked then another particle which is placed at a distance of light year can also respond to this poking without any messages being passed through the space. This sort of 'intimate connection' between the particles is termed as "Entanglement" by "quantum physics". 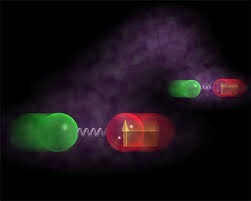 This law of 'Quantum Entanglement' defies Einstein's "law of relativity" - according to which no particle can travel faster than speed of light. Thus, Einstein termed this intimate connection in between the separated particles as "spooky action at a distance" and he believed the spookiness of quantum theory to be totally weird.